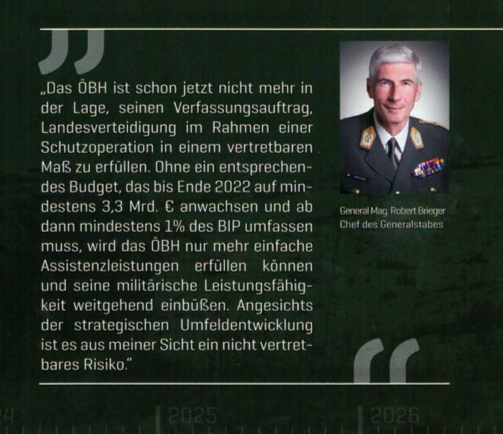 Der Generalstab des Österreichischen Bundesheeres schlägt Alarm - in einer Broschüre warnt Generalstabschef Robert Brieger, der oberste Offizier im Bundesheer, vor den Folgen der Unterfinanzierung des Bundesheeres. Lt. Sprecher des BMLV ist die Broschüre noch im Entwurfsstadium und sollte noch nicht veröffentlicht werden. Sie ist allerdings über mehrere Kanäle durchgesickert. Brieger spricht in dem Papier, aus dem die ZiB2 am 12.03.2019 zitierte und das auch der APA vorliegt, von einer "Diskrepanz zwischen dem Verfassungsauftrag, der Budgetlage und dem Realzustand" des Bundesheeres. Beachtlich: die Zahlen sind ohne Nachfolgeregelung Abfangjäger. 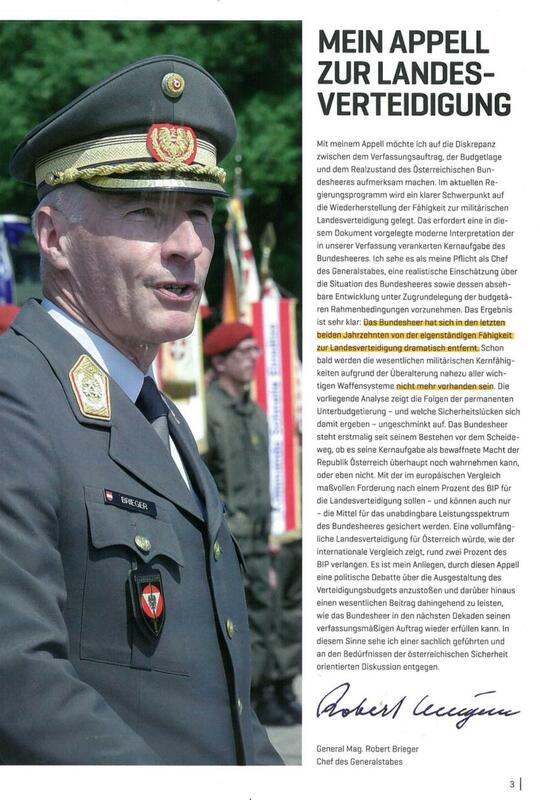 Der Generalstab zeigt auch auf, dass das Bundesheer in den vergangenen 15 Jahren regelrecht leergeräumt und in allen Bereichen halbiert wurde. 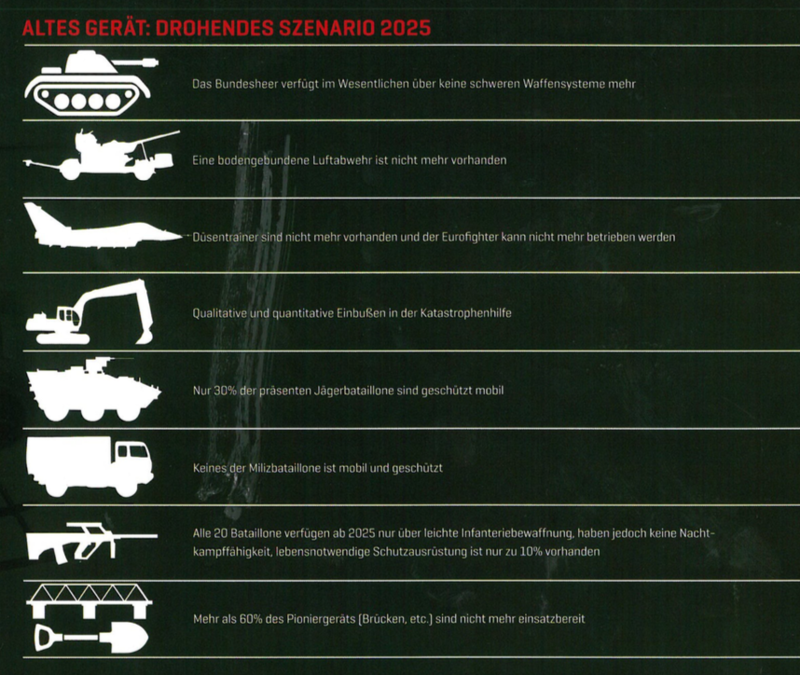 Neben zahlreichen Liegenschaften wurden seit 2004 41 Prozent der Luftfahrzeuge, 62 Prozent der schweren Waffen, 61 Prozent der geschützten und gepanzerten Fahrzeuge, 56 Prozent der ungeschützten Lkws und 49 Prozent der ungeschützten Pkw eingespart. 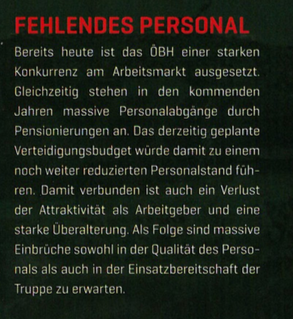 Der Personalstand sank um 16 Prozent, die Mobilmachungsstärke gar um 50 Prozent und das Jahreskontingent der Grundwehrdiener um 47 Prozent. Verteidigungsminister Kunasek hat im Jänner 2019 erklärt, dass er "ab 2021 mittelfristig" ein 3 Mrd EUR Heeresbudget zu erreichen gedenkt (lt Ö1 Interview). Das würde dzt 0,78% des BIP entsprechend - da ist man schon wieder fast 1/4 vom ursprünglich angepeilten "1 Prozent Ziel" entfernt. Tendenz fallend, aufgrund Wirtschaftswachstum. In richtigem Geld sind das mehr als 100 Mrd Schilling, ohne LRÜ! Das kann man finanziell nicht mehr aufhohlen! Das sehe ich auch so. 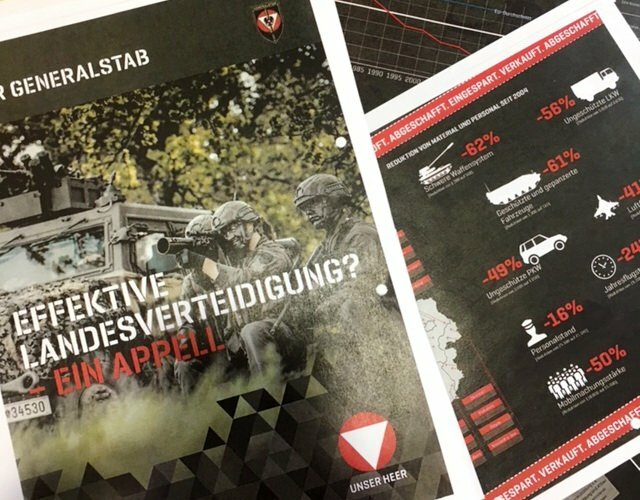 Das Bundesheer wird 2025 auf den materiellen Stand der B-Gendarmerie von vor 1955 zurückgefallen sein. Man hat seit dem Jahr 2000 Material, das über einen Zeitraum von 40 - 50 Jahren angeschafft worden ist, konsequent ausgemustert und verschrottet, ohne dafür jemals adäquaten Ersatz auch nur in Betracht zu ziehen. 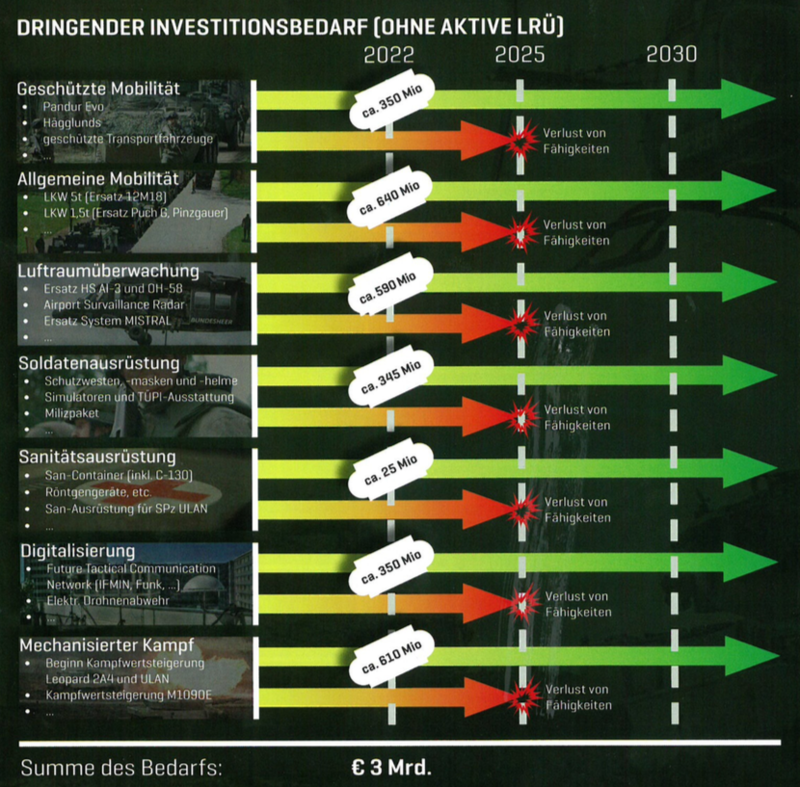 Schon im Jahr 2000 hat das BMLV den Investitionsrückstau mit 10 Mrd. EUR beziffert. Ich muss euch (leider) in eurer Skepsis beipflichten. Ich kann mir auch beim besten Willen nicht vorstellen, und es gibt auch keine Anzeichen, dass unser Heer die nötige Investitionssume nur annährend erhalten wird, wenn überhaupt dann ein geringer "symbolischer Beitrag". Das Gap ist mittlerweile zu groß. 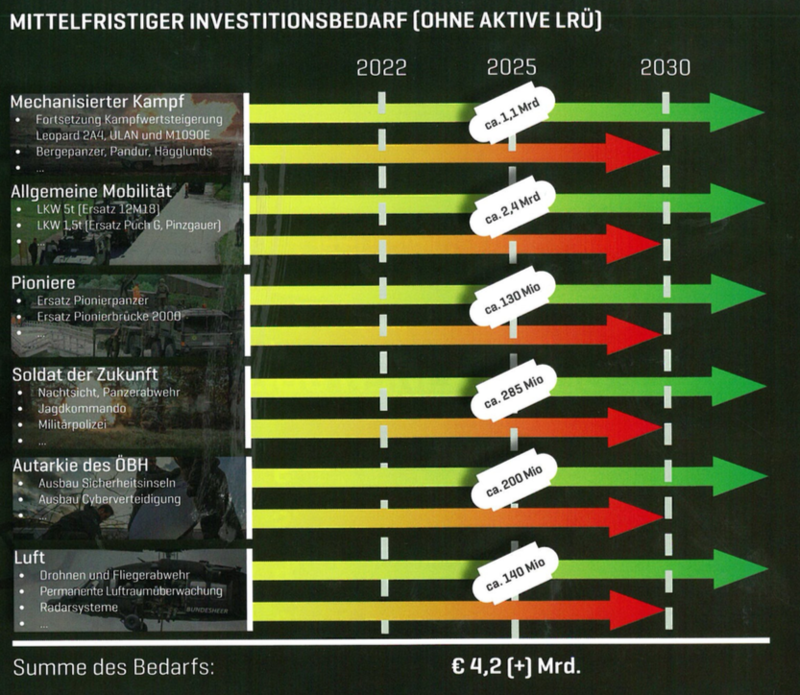 Es bräuchte mehrere zeitnahe Sonderinvests in Milliardenhöhe. Dafür fehlt der politische Wille und vorallem die Unterstützung des Volkes, der gelerne Österreicher/die gelernte Österreicherin lebt in einer "sicherheits- und verteidigungspolitischen Blase des surrealen Weltfriedens". Eine verfassungsgemäße budgetäre Ausstattung, ergo 1% vom BIP, wird es mit hoher Wahrscheinlichkeit auch nicht geben. Ich kann es mir aufgrund der vorliegenden Zahlen, Daten und Zielsetzungen der Regierung nicht vorstellen. Nimmt man die budgetäre Lage der letzten 2-3 Jahrzehnte als Beurteilungsgrundlage, so ist unser Land offenbar nicht schützenswert. 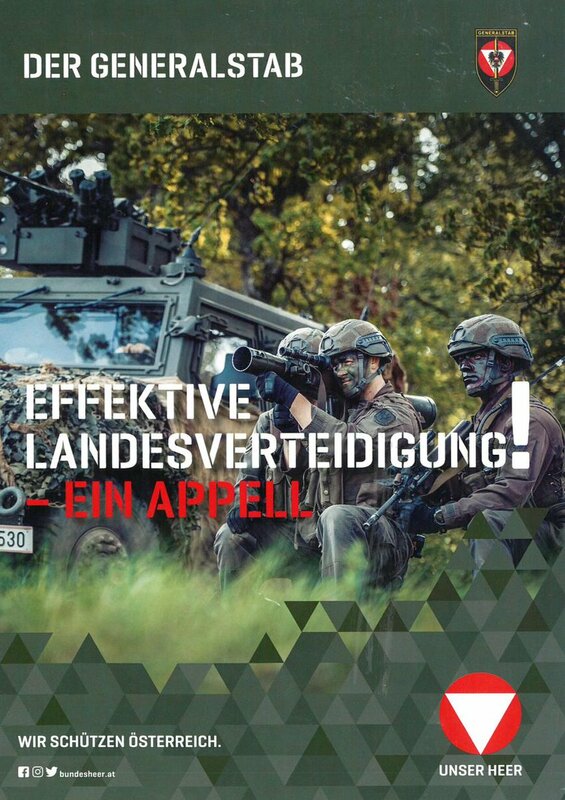 Die Konsequenzen für unser Heer und unsere Souveränität will ich mir nicht ausmalen. There is mounting evidence that something is seriously wrong with pay and conditions in the Defence Forces, all three branches of which are finding it difficult to recruit personnel. This week it emerged that two Naval Service vessels were unable to put to sea because of crew shortages, while reservists were being used to fill gaps in another vessel. The basic salary of €28,000 for members of the Defence Forces with the rank of private is clearly not enough to attract recruits in an expanding economy where jobs are plentiful. In the past members of the Defence Forces were provided with accommodation which compensated for the poor basic salary but for many this is no longer available. According to retired Regimental Sgt Major Noel O’Callaghan, a leading member of a group lobbying for improved pay and conditions, 1,760 Defence Forces members are on family income supplement. The situation is so serious that the chief of staff of the Defence Forces, Vice Admiral Mark Mellett, has sought to make a verbal submission to the Public Sector Pay Commission about military pay. Speaking before addressing the annual conference of PDforra, the Defence Forces’ rank-and-file representative body, he made no bones about the fact that the military was facing serious “challenges”. He said the loyalty that serving members of the Defence Forces showed to the State had to be reciprocated and pay was the number one issue for serving soldiers, sailors and Air Corps personnel. He pointed out that there were 630 Defence Forces personnel currently serving in 13 missions in 13 countries, and the Naval Service had rescued 18,000 people in the Mediterranean. He noted that remuneration was the worst in the public sector. Numbers in the Defence Forces have continued to fall despite recent recruitment campaigns, with many personnel now concerned the situation is beyond rescue based on the Government’s current approach. 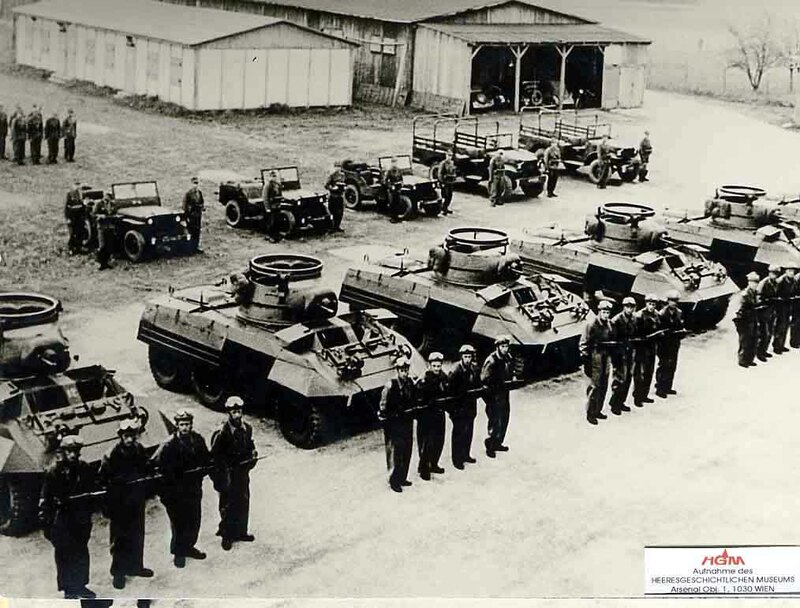 The full strength of the Army, Naval Service and Air Corps combined should be a minimum of 9,500 personnel but has now fallen below 8,500; the lowest point since numbers were increased in the 1970s in response to The Troubles erupting. Military sources said Brexit and the continued threat of domestic and international terrorism meant the security climate was now marked by uncertainty, adding with a reduced military meant Ireland was vulnerable. The sources added rates of core pay, and especially allowances for extra duty, were so poor personnel were now leaving at a faster rate than new recruits were coming in despite a recruitment push. Raco, which represents Defence Forces officers, and PDFORRA, which represents soldiers, sailors and aircrew, have both described the continuing drop in numbers as a “crisis”. According to figures obtained by The Irish Times from the Defence Forces, there were 8,390 personnel serving at the end of January, with an additional 531 in training. Numbers are supposed to be maintained at a minimum of 9,500 serving personnel, excluding several hundred recruits in training at any one time. Minister of State for Defence Paul Kehoe TD said the Public Service Pay Commission was currently examining issues around the retention of personnel, adding the Government would consider its recommendations. A minimum establishment of 9,500 was committed to by the Government in the White Paper on defence published in 2015 that set out the State’s defence policies for the decade ahead. Recruits to the Defence Forces are paid €398 per week gross during the first 17 weeks of their training. They must pay €40 of that for rations each week. So many officers trained in counterterrorism, cyberdefence and other key areas are leaving the military that the viability of the Defence Forces is now at risk, the officers have warned. The Representative Association of Commissioned Officers (Raco) said a failure of Department of Defence policies is to blame. In a strong statement from an organisation that rarely speaks out against Government policy, Raco has said the sheer numbers of personnel now leaving the Defence Forces has created a crisis. General secretary Comdt Conor King said the Department of Defence must work so more personnel can be retained. Those who joined from 2013 also face being forced to retire on age grounds long before they would be entitled to a pension, and that was forcing many to plan now for an early departure from the Defence Forces. They were planning to leave in their 30s, which would normally be the point of their careers where they would be taking up senior leadership positions. “The current retention crisis in the Defence Forces is well documented but what this survey shows is that the situation will only get worse unless the Government takes decisive action,” Comdt King said. “Any objective person can see that Department of Defence policies are failing our members and failing the State. “The cost-benefit of retention over unsustainable recruitment has yet to be realised by the Department”. Raco is calling on the Government to intervene to help end what it says is a retention crisis “as it is spiralling out of control with the future viability of the Defence Forces under threat”. A Raco Amárach Consulting survey of more than half of its 1,200 members has revealed 79 per cent are planning to leave “due to the lack of a viable career path as a result of Department of Defence policies”. Included in the group of European neutrals is the Republic of Ireland. Ireland has pursued neutrality since World War II. A realist perspective appears to explain Irish neutrality quite easily. After all, Ireland's geographical isolation from the European continent, shielded by the bulk of the English mainland, provides with a perfect place to hide from the past century of European conflict. In addition, the lack of any true capability to project power beyond its shores, and perhaps the inability to protect its shores from external threat, makes a foreign policy choice of belligerence unobtainable. With the exception of its historic, hegemonic neighbor, Great Britain, Ireland has no enemies and no international intrigues. It seems that one would be hard-pressed to find a more uninteresting story than Irish neutrality. The Republic of Ireland has neither the ability nor desire to engage in conflict and thus pursues neutrality out of necessity prudence - end of Story. Irish neutrality meant staying out of the growing division in Europe. It did not mean that Ireland was impartial in all senses of that term. In fact, Ireland was not ideologically neutral (Doherty, 2002). From 1939, De Valera's neutrality policy tried to walk a fine line. It sought to maximize Irish independence, but it also realized the strategic importance of Ireland to British defense. This required Ireland to remain benevolent toward Britain, including military cooperation in case of a German invasion after the fall of France in May 1940. However, the Irish insistence on maintaining diplomatic relations with Germany irritated the Allies (especially the USA and Britain) right up to the end. The consequences of Irish neutrality were fourfold. First, Ireland emerged relatively unscathed compared with the rest of Europe. One author notes that "apart from isolated German bombings, and an occasional explosion caused by drifting mines, independent Ireland suffered not at all" (O'Halpin, 1999: 254). Second, neutrality contributed to the international diplomatic isolation after the war. This culminated in Ireland's failure to gain United Nations ship until 1955, due to vetoes cast by the Soviet Union (Doherty, 2002; 1999). Third, it widened the divide between the North and the South 1999). The Germans bombed Northern Ireland mercilessly, and, the inhabitants of Northern Ireland suffered, unlike their comrades Fourth, the success of neutrality created a popular attachment to enduring illusions about the moral basis of staying out of other people's (O'Halpin, 1999: 254). Keatinge goes so far as to say, "to the nationalist fication for neutrality was added an appeal to universal moral 1945 the basis for a national tradition of neutrality, both as a value had been laid; an orthodoxy, if not a dogma, had been established (1984: 20). After World War II, Irish foreign policy contained four key features: continuing preoccupation with partition, emigration, and few close relations with any states other than Britain and the USA (Whelan, 2000: 214). Of these four, neutrality was the central policy. Doherty (2002) suggests that the basic principle behind Irish neutrality after World War II was the avoidance of alliance. He suggests, "Irish neutrality is not so much principled neutrality but unprincipled non-belligerency" (Doherty, 2002: 17). This is because Irish security did not need Irish neutrality, as NATO insured the former. Thus, maintain a credible defense force, something that distinguished it from European neutrals in postwar Europe (and something to which I will return later). The Irish case is not so obviously realist. Ireland maintains a minimal defense force. The Irish government spends less than 1.5 percent of gross national product on defense (Tonra, 2001: 118). Its defense expenditure per capita is the lowest of all five neutral nations (Keatinge, 1984: 41). Ireland has almost no military capacity on which to carry out foreign policy. Thus, Keatinge calls Ireland a "disarmed neutrality" (1984: 72-4). Gilland calls Irish policy a "military neutrality" (2001: 141). Irish singularity is therefore partially a product of its amazing lack of any credible defense. Geographical and strategic reasoning contributes to the ability of Ireland to pursue this policy. NATO implicitly guarantees the security of Ireland. Further, during the Cold War, when the other neutrals occupied a space between the two competing blocs, Ireland was safely tucked away behind Britain. This emphasis on collective security and not state-centered self-help supports a liberal view of Irish neutrality and rejects a realist view. Wo gräbst du immer wieder dieses Zeug aus? Alleine für Mobilität, geschützte Mobilität und Mechtruppe fordert Brieger mehr als 5 Mrd. Euro! Zurzeit drückt die Regierung die neue Mindestsicherung durch, auf eine Erhöhung des Budgets zu hoffen ist realitätsfremd. Das ganze liest sich wie ein Wunschzetttel ans Christkind, Summen für die Sanierung von Kasernen sind gar nicht angeführt. - um Österreich zu verteidigen, es 9 regionale Kommanden braucht. Diese Frage kann man auch den LH stellen.